Last month, a new book edited by my PhD supervisor, Lisa Young, and another great Canadian political scientist, Harold Janson, was released by UBC Press. 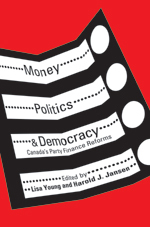 Money, Politics, and Democracy: Canada’s Party Finance Reforms takes a comprehensive look at the origins of the 2003 election finance reforms and the impact they have had on elections, political party organization, and the relationship between parties and Canadian society. With Prime Minister Harper promising to eliminate the quarterly allowances parties if re-elected, the reemergence of the “in and out scandal”, and the continued attention by the media to the subject (here, here, and here), this book is required reading for anyone interested in the story behind the reforms and how we can understand their impact. Apart from my clear self-interest in this title (I co-authored a chapter) being well read, the contributions in this volume tackle some of the critical questions that surround party finance in Canada. Why did the 2003 reforms emerge in the first place? How has state funding of political parties affected their organization, relationship with stakeholders, and the competitiveness of Canada’s political system? Is minority government related to public funding? Can political parties self-regulate their leadership campaigns? My chapter, co-authored with Munroe Eagles from SUNY Buffalo, looks at how the reforms have affected local party organizations. In 2004, Jean Chrétien’s Liberals banned corporations and unions from funding political parties. In 2008, opposition leaders were prepared to defeat the Conservative government over its proposal to eliminate public subsidies to political parties. In Money, Politics, and Democracy, Lisa Young and Harold Jansen lead a distinguished group of political scientists in exploring the issues that led to the dramatic showdown. Are publicly funded parties compatible with the basic tenets of democracy? What effect have party finance reforms had on the balance of power between parties and donors, on the relationship between national parties and local organizations, on electoral competition? This timely volume reveals that the financial centre of gravity for political parties is shifting between national and local organizations as individual donors replace unions and corporations. To ensure their financial survival, parties must now maximize their numbers of seats and votes. The first comprehensive study of modern campaign finance reforms in Canada, Money, Politics, and Democracy suggests that campaign finance reforms have shaped party organization and electoral competition, contributing to successive minority governments. I recommend getting yourself a copy. If the Conservatives are re-elected, you can be sure they will introduce reforms to eliminate the public subsidies.